You know a friend of a friend who swears by airbrush tanning, but you’re not sure if it’s worth the hype – or the money? We’ll let you in on some of the advantages of airbrush tanning. No risk of UV damage! The sun, and it’s synthetic friend the tanning bed, use UV rays to penetrate your skin and give you a tan. But that penetration also comes with risks. The sun can cause damage ranging from a sun burn to skin cancer, including discoloration & sun spots, wrinkles, and rough, leathery texture. 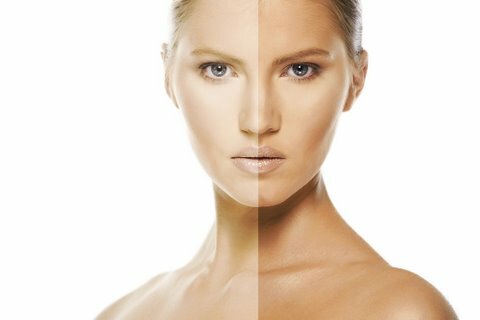 Airbrush tanning completely eliminates these risks because there are no UV rays involved. At all! Low allergy risk. Our formulas are 100% organic, vegan, and cruelty free. They don’t irritate the skin the way some harsher formulas can. Covers skin blemishes. Airbrush tanning can help even your skin tone and reduce the visibility of varicose veins, cellulite, and stretch marks. You’ll also look healthier, younger, and slimmer with a little bit of color. Naturally fades. Unlike some self-tanning creams or sprays, an airbrush tan will not peel off and leave blotches. Looks like the real thing! An airbrush tan isn’t a stain or dye. It won’t leave your skin looking orange. It’s a natural compound that does the work, so a natural look is your result. Won’t ruin your clothes. Unlike some home tanning products, airbrush tanning formulas wash out easily if you get some on your clothing. Quick & affordable. It’s not often you can get so many results in under 20 minutes and less than $40.